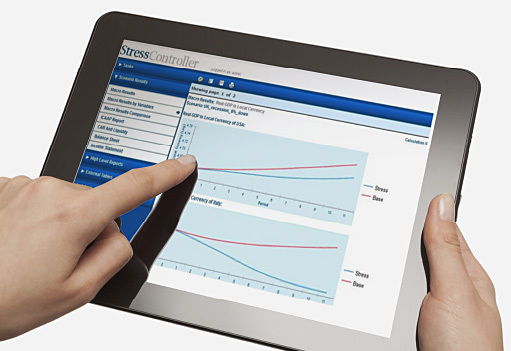 Stress Controller is a powerful and highly flexible platform for performing a wide range of stress testing and financial planning activities. The software contains facilities for importing, generating and managing macroeconomic stress scenarios. Macroeconomic scenarios may be created by the user or based on scenarios provided by regulators or senior management. Users may trace the impact of the scenarios over time on individual exposures, portfolios, capital, expected losses, provisions, liquidity ratios, balance sheet and P&L. The model also provides stressed ratings, LGD parameters, transition matrices and factor correlation that may be used as inputs in other portfolio models. Analysis may be performed at a group level or broken down by operating unit or subsidiary. We offer a wide range of different modules suited to a wide range of client needs. For more information, contact us. Scenario-based RORC Optimisation of Bank Loan Book: case study shows how top down analysis of a bank’s assets can optimise Return on Regulatory Capital. Consistent Scenario Expansion: case study on data-driven ways of consistently expanding macro scenarios. Banking System Stress Testing: case study shows how stress testing may be accomplished for a set of banks with inter-bank obligations. Stress Testing for an Asset Manager-Private Bank: Illustrative case study of stress testing for an asset manager including AUM, balance sheet, P&L and key capital planning ratios.